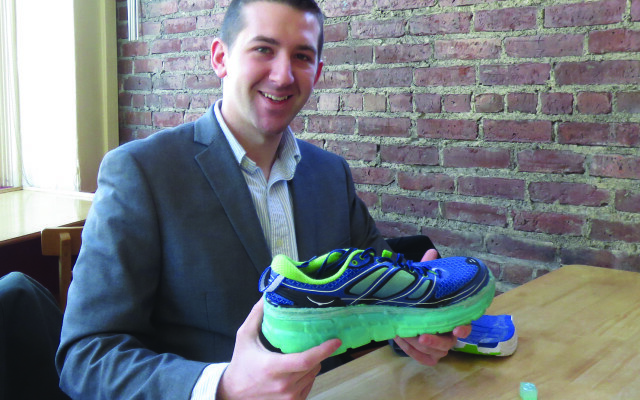 Cobbler Technologies prints 3D soles to revolutionize shoe industry. Three-dimensional printing is a concept that’s hard for many of us to wrap our heads around, but for Andrew Katon it’s just another day at the office. Katon is co-founder of Cobbler Technologies, a small, high-tech startup company based in Bangor. Cobbler Technologies is introducing a cutting-edge 3D manufacturing process that will bring 3D printing to a whole new level, and the focus for their innovative process is the shoe industry. For those of you unfamiliar with 3D printing, here’s a way to visualize it: when the ink-based printer in your home or office receives your document information, it lays down a layer of ink in your desired pattern. In 3D printing, other substances are laid down according to your specifications, one layer at a time. You gradually increase the height from your base with each layer, and voila! You have a three dimensional product. 3D technology is already changing the face of many fields—automotive, aeronautical, medical, defense, education, robotics, architecture, and retail manufacturing. Katon began working on 3D technology while studying engineering at the University of Maine. His particular interest in the shoe industry grew from multiple factors. Individually customized shoes have high consumer appeal, especially to athletes. New England already has a strong market in footwear, and the shoe industry is ripe for 3D printing. Katon’s new printer has an essential advantage. The process involves a trademarked method that uses Atomized Particle Deposition (3DAPDTM). Solid materials are pressurized into a sprayable form, then deposited in layers of fine droplets. In other 3D printers, you have to change nozzles in between layers of materials like rubber, plastic, or foam, and the different layers have to be glued together. Katon’s company has produced a machine that can blend materials through one continuous spray. This “functional grading” creates a chemical bond between layers, eliminating the need for glue and the need to change nozzles. Cobbler Technologies includes a dedicated team of engineering and business specialists. Their expertise has brought increasing attention from investors and manufacturers. The company now has a partnership with Dassault Systemes, a software design company. They were invited to take part in this year’s “Venture Summit West” event for emerging growth companies. By the time this story goes to print, they will likely have finalized negotiations with a manufacturing partner. They expect to work exclusively with their launch partner until early 2019, when they hope to open the market to other manufacturers. Katon, a quiet young man, exudes an undercurrent of elevated anticipation over his printer’s capabilities and the future of the company. Because the industry is changing so fast and the stakes are so high, he was reluctant to share too many details of their negotiations, their technology, or his pending patents. “The paranoid survive,” he said with an apologetic smile. The moral? New developments arise every week in his industry, and you have to be careful what you reveal. Most of Katon’s college classmates sought opportunities out of state after college. Katon loves Maine and chose to build his company here. If technology and manufacturing trends continue on their current trajectory, it looks like his decision is going to pay off. Because of 3D printing’s capacity to deliver customized products more efficiently, small-scale local manufacturing may be the wave of the future.